I had wrapped myself in yards of beautiful white. I would be beautiful. I would be something to treasure. And so I wrapped and wound and tightened each bit of fabric to myself. I walked to him, clothed in strong beautiful fabric. I had worked hard to wear all of this. I walked down the aisle and we said I do. My beautiful white fabric was rippling, flowing, flying in the wind. It was a beautiful sight, a picture of womanhood I had long cultivated. The first few weeks were lovely. My fabric stayed tight to me. It was– -in every way—the strong beautiful fabric I had made and cultivated. But as the days wore on, the fabric wore out. It began to unravel. Seams plucked loose and rips widened. I lost pieces of my once strong fabric to the wind of time and life. I could not stop it. I could not grab it again. It was gone, and with it so much of what I had considered worthy. The fabric fell away to reveal a charred and cracking heart beneath. I grasped at the white, flowing material to hide what I deemed bruised and ugly. I was frantic. My hands pulled and tightened, but the once strong and beautiful material would not submit. I followed the threads and the pieces floating way and I felt exposed with each new step. I could not understand for I had wrapped and woven the fabric tight to myself. I searched the sky and scrounged in the dirt. I had to find what was tearing at my strong beautiful fabric. I was unrecognizable and I was ugly. The farther I ran, the more the material slipped away. I was frazzled. My wounds and bruises were exposed and my charred womanhood could no longer be hidden. There was embarrassment and shame, because surely all of this could no longer be treasured. Surely, I wasn’t enough. My weary body could not walk much further and I gave up the fight. I collapsed in a heap, the tireless work to keep my strong and beautiful fabric had rendered empty. I was left with pieces and the exposure of my heart. I pulled myself closer to make a shield about myself. After many days, I dared to open my eyes. I dared to have courage again. And there I saw him, the man I had promised myself to. In his hands, he cradled every last bit of white material. His fingers were bleeding and his hands cracked and sore. 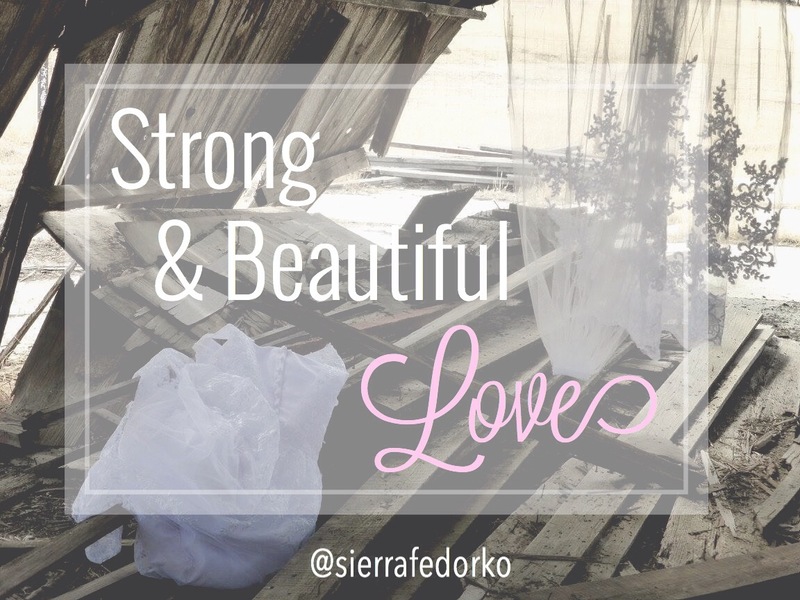 For many days, he had pulled, pried, and torn away my strong and beautiful shroud. He touched his hand to my charred and bruised heart with the gentle words, “I want this.” I cried, but not in shame. I cried because he believed I was enough. I was worthy. I was desirable without my handmade beautiful fabric. My body shook, because every ounce of energy had been used in my pursuit to hide. I took the fabric from his hands and I threw it far from us. It whipped around in the air, writhing in death, and finally disappearing. And once it was gone, I looked at him anew. I had been so obsessed with hiding that I had neglected to know him, the man I had promised to love! My hand to his heart and his hand to mine became the only fabric necessary. Next > No Frowns at the Stompin’ Grounds!